Overall: The ocean generally feeds it's corals continuously (although maybe more at night), so duplicating this allows the corals (and some fish, especially tangs) to eat more like they do in the wild. Less rotting: When you manually feed once or twice a day, much of the food gets past the fish and corals, and rots in the rocks and sand. When you feed continuously, the fish and corals get most of the food before it settles. So you get to feed the same amount, but the fish and corals get more, and less rots. Keep pumps running: Many people turn their return pump off while feeding, so that food does not go to the sump. This is not necessary with continuous feeding, since most of the food will be eaten in a few seconds, and thus won't even make it to the overflow. So pumps last longer. Mandatory for NPS: Non Photo Synthetic corals must have as close to continuous feeding as possible. Some of the more difficult NPS will actually close up if you feed too much at one time; thus, small continuous amounts are the only way to keep them alive. No forgotten feedings: While not critical to fish, some corals (and certainly NPS) may not open again if you miss too many feedings. More accurate: Since the feeder is automatic, you know for sure how much you are feeding, and how much you have fed. This makes it easy to compare coral growths (as well as nuisance algae growth) while varying the feeding amounts. Free time: I thought that I'd miss feeding, but I don't. I still get to watch the feedings (for me, every hour), I just don't have to stand up and do them. 1. Tiny feeding amounts: As little as 0.1 milliliters at a time. 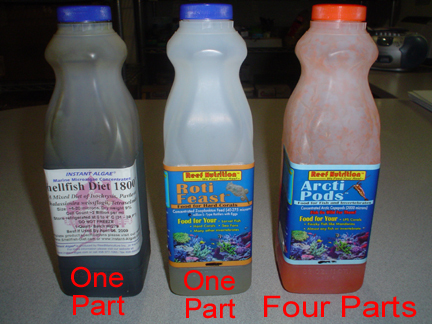 The foods that I'm using (Reed's Phytofeast and Reed's Rotifeast for the NPS corals; Reed's Arctipods for the other corals and for the fish) are very concentrated. Reeds recommends that the foods not be diluted in water; so very very small amounts of the concentrate must be fed each time. 2. Adjustable feeding amounts: In order to experiment with how much can be fed before problems arise (like nuisance algae), it needs to be pushbutton-adjustable. If you are feeding non-concentrated foods like melted mysis cubes (1 cube = 3ml), you could easily adjust it to a higher amount. 3. Adjustable feeding schedule: As short as every few minutes, or as long as every couple of hours. Or just plain continuous. 4. 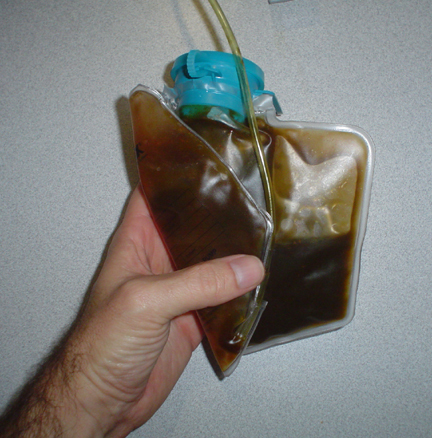 Ability to feed very thick liquids, including melted mysis cubes. 5. Refrigeration: Would keep the liquid chilled at all times, with an adjustable temperature as low as freezing (but would not freeze it). 6. Capacity: Would hold enough to feed an entire month without refilling. 7. Would sit on top of tank, so that the food would go directly into the display. This means the unit would need to be small, quiet, and have a decent appearance. 9. Mechanically Safe: No possibility, at all, of all the food being fed at once. 10. Electrically safe: Splashed water, condensation, or salt creep would not shock anything, and would not cause failure. 11. Settling: Larger pieces of food should not settle to the bottom of the food container. 12. Cost: This is subjective, but for me the ability to keep NPS corals, and to not have to feed again for an entire month, means that I'd be willing to spend several hundred dollars. 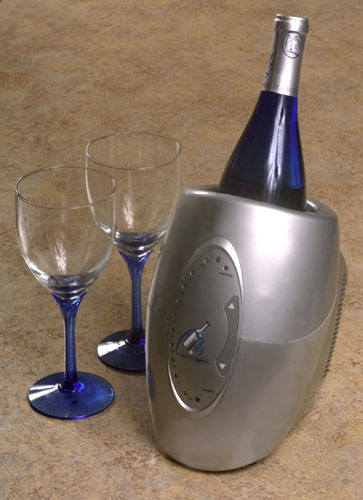 A "digital" or "electronic" wine chiller is a thermoelectric chiller that does not use a compressor; instead it only has a fan. Some models actually have a digital readout, but the one that worked best for me does not. 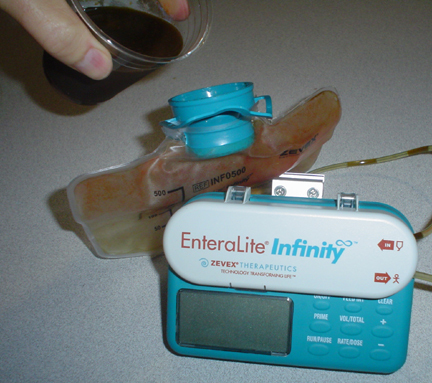 An "enteral" feeding pump is a peristaltic medical pump designed to feed patients who cannot eat; it pumps liquid food directly into the intestine. 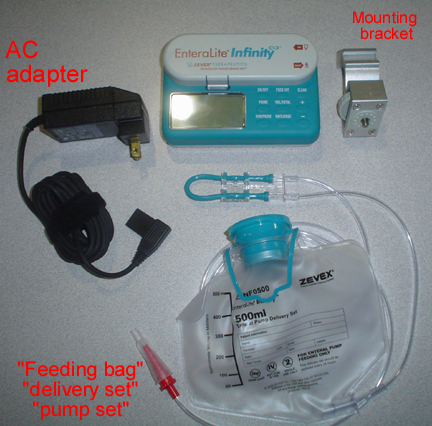 (Note: An enteral pump is different from an "IV" pump). Nov 17 2011: This particular unit does not seem to be available on Ebay anymore, but many other units are, and are even cheaper. However, I have no idea about their operating characteristics. 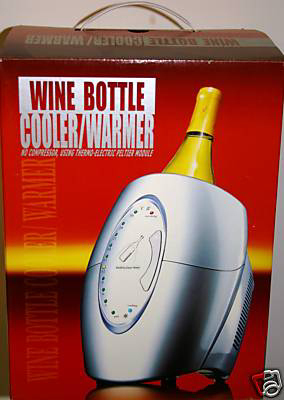 Just search for "wine chiller". To find them on Ebay, just search for "zevex infinity". 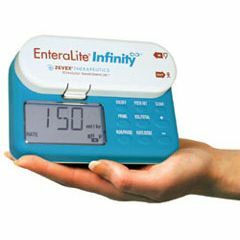 (1) Tiny feeding amounts: Since enteral feeding pumps are designed to feed concentrated liquid foods to people, they are already set up to handle small amounts of these types foods. My display is about 100 gal, and my starting point was 0.4 milliliters every dose. (2) Adjustable feeding amounts: This pump can pump as little as 0.1 ml at a time, and is adjustable by just pushing the up or down buttons. I'm feeding 0.4 ml per dose (about 10 ml per day) in my 100gal. A 10 gal nano could get about the same concentration of food by feeding 0.1 ml every 2 hours. As corals or fish are added/removed, or as filtering varies, you can adjust the feeding amount so that nitrate, phosphate and nuisance algae don't get out of control. 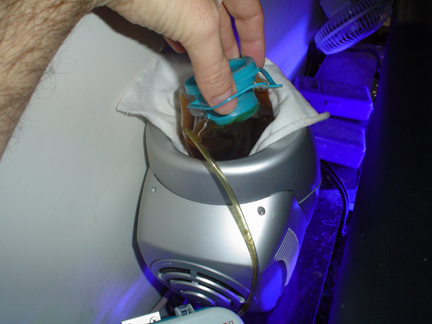 (3) Adjustable feeding schedule: This pump can feed as often as every 60 seconds. However, if I did this, I think the fish would hang out at the feeding tube and eat everything that came out. So I feed every hour; this way the fish can't get all the food, and it makes it to the corals. (5) Refrigeration: This was a tough one. Like other people, I first thought about a dormitory fridge, but that would be difficult to set on top of the tank. And you don't want a lot of distance between the fridge and the tank, because the food will be sitting at room temp (actually higher when it gets near the lights.) So the wine chiller works perfect. 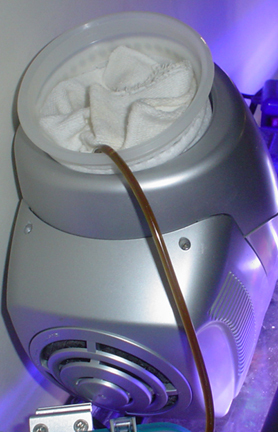 The distance of tubing from the chiller, through the pump, and into the water, is 24" (60cm) (although this could be shortened with creative placement and splicing). At my current rate of 0.4 ml/dose, the food moves 2.5" (63mm) per hour, thus staying at room temperature for 9.6 hours. Seems to be an acceptable time for my first attempt. Less is better, of course, because it's less nitrate and phosphate that bacteria will cause. (6) High capacity: This was an easy add-on feature, since everything is already in place. 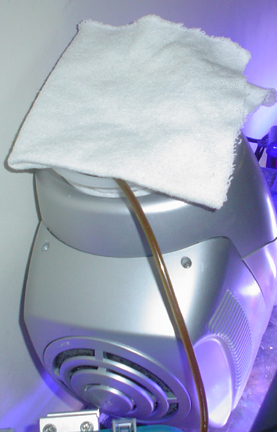 The Zevex pump uses 500 or 1000 ml bags; the 500 bag fits right into the chiller, but not if you fill the bag all the way up. 120 ml (12 days of food at 10 ml/day) is no problem, however, with plenty of space. I'll be trying more soon. 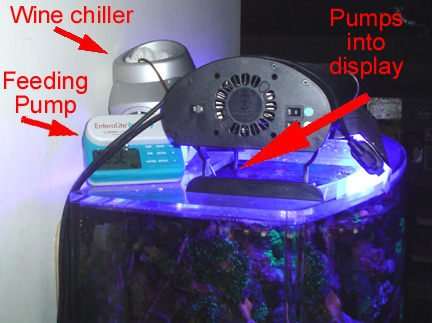 (7) Top of Tank: When turned sideways, the chiller is only 6" (15cm) wide, and fits easily behind my light. 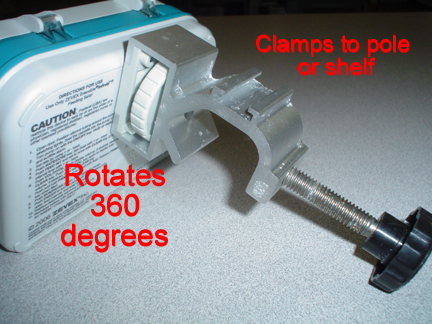 And the pump can be laid flat, or stood up, or attached to the chiller (or pole, or bracket) with the included screw-on bracket. This allows the food to be released right in front of a powerhead, which sprays the food all over the corals/display. (8) Reliability: The pump was designed for battery operation, and sure enough I've gone well over one month of operation without charging it. (Most medical patients use much more food than we do, so the time between battery charges is much much longer.) And if the bag runs out of food, a beeper lets you know. (9) Mechanically Safe: The last thing you want is for a month's supply of food to be dumped in at once. Being a medical device that keeps people alive, there is very little chance of this pump failing in that fashion. And if the bag were to ever leak or break, it's inside the chiller (which you seal with silicone at the bottom), so the food would just sit there and stay cold. (10) Electrically Safe: The pump is completely sealed; not just water resistant, but waterproof. The instructions actually say to wash the pump by pouring water on it. Salt creep or splashing is a non-issue. Electronically, there is no way for the pump to stick "on" and accidentally dump the whole bag. There are all sorts of safety features that would stop this from happening. The chiller is powered by just 12V (the transformer is a long ways away). While it would be possible to splash water on the chiller and short it out, it should not harm anyone/anything. If the chiller did fail, the food would still be fed to the tank, but it would just slowly start getting warmer over the next few hours. (11) Settling: If you were to have a large container with thin and thick foods mixed together, the thick food (like mysis) would settle to the bottom and either not get used, or get used first. The feeding bags used by the pump, however, can be twisted and rolled up, thus making many small places for the bigger food to stay. (12) Cost: The chiller is easy; mine was $20 USD (new in box) from Ebay; just add shipping. The pump is a different story. I monitored Ebay for two months, and saw these pumps sell for as little as $130 used, or up to $600 new. (They are $1500 retail). Plan to spend some time in your Ebay search, checking each day for a new listing. I paid $300 for mine, and $350 for another one. Another "ebay" site, for medical items, is DotMed.com. Just search for "zevex". In any case, make sure you get the blue Infinity, NOT the orange one. The orange one will not work. Will it cool to freezing? Some units will only cool to 25 or 30 degrees (F) below the room temp. The room temp near the lights could be 100 degrees, and thus, 70 degrees is too hot for the food. This unit can chill to freezing while it's right next to the lights. Is the inside compartment waterproof? There will be constant condensation, melting ice, and the possibility of a broken bag. This model is almost waterproof the way it comes; with one application of silicon along the bottom seam, it is totally sealed. Does it connect to 12V or 120V? You don't want 120V leading all the way up to the chiller. Instead you want the 120V to go to a converter/transformer (like with a laptop), and then have the low voltage wire run up to the chiller. This model works this way. Will it continue to run if not touched? Many models are designed to turn off after a few hours. This model stays on constantly. Small Dosages: This is the important one, and you probably won't find out until you get the wrong pump in your hands (I didn't). 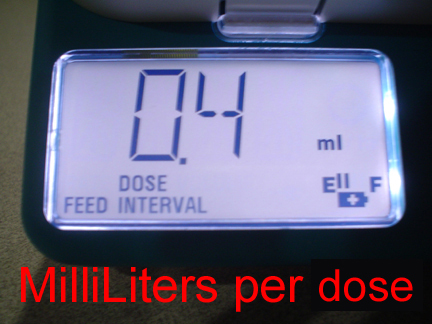 Most enteral and IV pumps are 1.0 ml minimum. This means that the smallest amount it will pump at one time is 1.0 ml. That's a LOT of concentrated food! (One mysis cube is 3 ml.) I'm currently dosing 10 ml/day. If I had to dose 1.0 ml at a time, I'd have to wait to dose about every two hours. And a 10g nano could only dose this once a day. So having a 0.1 ml capability opens up an entire world of feeding. The other advantage of small dosages is that you can dose even more often than once per hour. I could dose 0.1 ml every 15 minutes, and still end up with 10 ml/day. Interval Feeding: This is the other important one. Many pumps don't have this option (and they don't list this info on Ebay, so you won't know); instead they dose a constant amount, all the time. If you dosed constantly, your most aggressive fish would hang out at the tubing and eat everything before the other fish and corals got anything. You need to burst out all the food at one, every so often. Of course, a coral-only tank is different, and fortunately the Zevex pump does continuous pumping also. 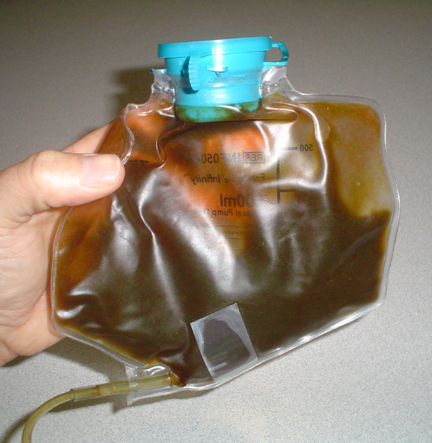 Not for IV use: IV pumps are those huge ten or twenty pound contraptions that are mounted on a pole in hospital rooms. They are very complex, and many of them have computer connections. And they are very expensive. The only way to get one under a few hundred dollars is to get one from the 1990's, but then it becomes impossible to finds the "drip sets" (or "cassettes") that you MUST have for it to work. I bought two of them, and could get neither to work without the cassettes. 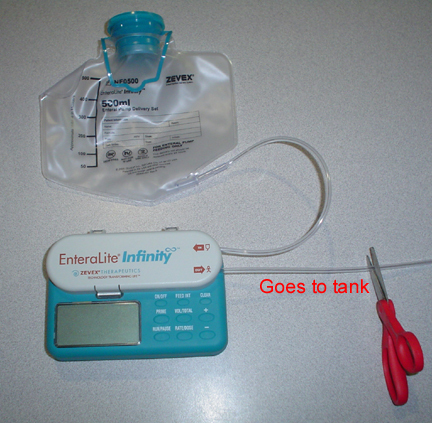 Small Size: IV pumps are just too big to set on top of a tank. Even some enteral pumps are too big. 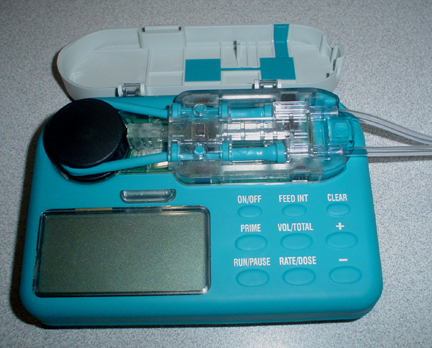 But this Zevex model is probably the very smallest there is of ANY pump. And certainly the thinnest. Most pump pics on Ebay don't show or tell you how deep the pumps are. They look small, but when you get it, it's 9" or 12" deep. 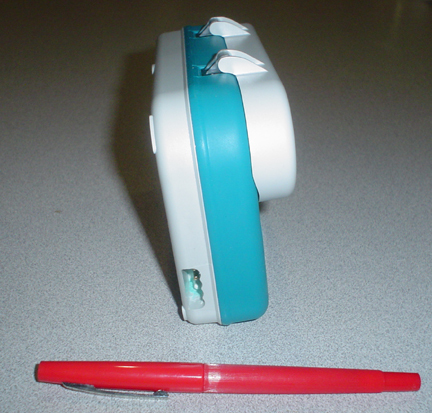 The Zevex is just 2" (5cm), including the tubing cover. Waterproof: Very few pumps of any type are waterproof; they were made for the hospital room, not for walking around outside. 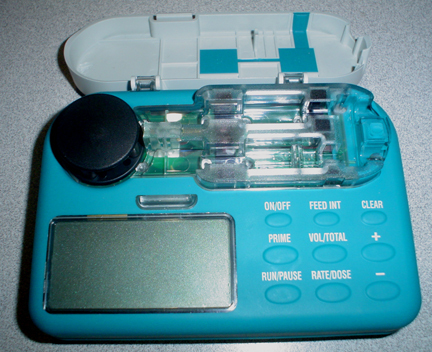 But this Zevex pump, if operating on batteries, would actually work underwater if you dropped it in your tank. 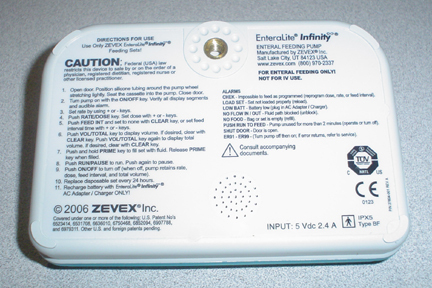 Current Model: This model is NEW, and is CURRENTLY (January 2009) being manufactured (it just won the product of the year award for medical feeding devices.) This means that you will be able to get the feeding bags ("delivery sets", "pump sets") for many years. A delivery set (usually with a feeding back attached) is required to run the pump, since the pump detects that the proper set is installed. Delivery sets are cheap to buy, but impossible to DIY. Looks Nice: I think this pump is the best looking of all of them. You won't see it very much on top of a larger tank, but on a nano it would be very noticeable. 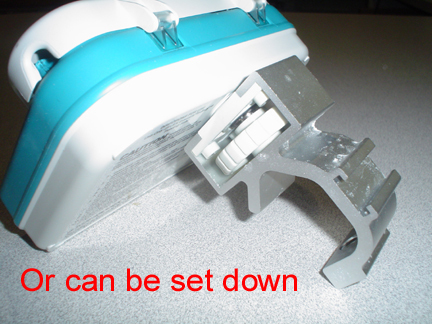 Easy to Use: After reading the instruction book, you can set the options up in about 10 seconds. Adjustments like dosage and interval take about a second to adjust. It's an amazingly well built pump; I really think it's worth the $1500 retail. Note: Some folks have experimented with syringe pumps. But syringe pumps are very large, not battery operated, and unless you get the expensive "retracting" models, then you have to take the syringe out and retract the plunger each time it bottoms out. Plus I'm sure these pumps are not waterproof. After looking at syringe pumps long and hard, I finally gave up and kept searching until I found the Zevex pump. I can see why continuous feeding has had a rough start until now. Important: (1) Make absolutely sure you get the AC adapter with the pump. 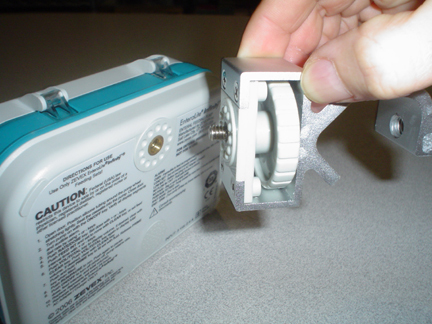 The adapter uses a proprietary waterproof connector to the side of the pump. 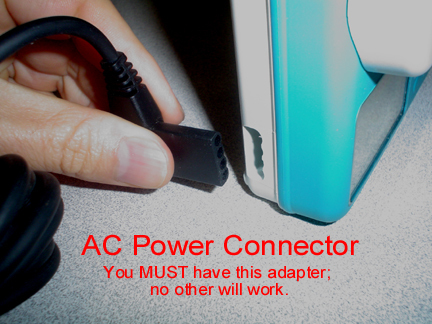 You cannot use any other type of adapter, and you cannot buy this adapter anywhere else. 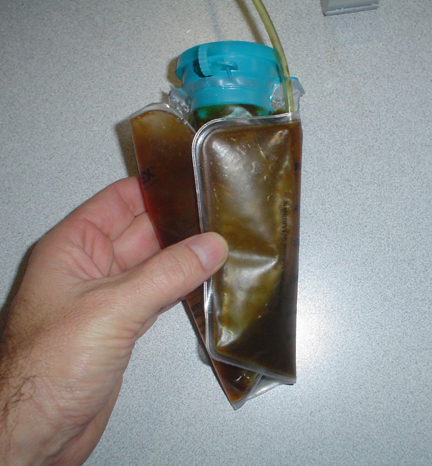 (2) Get several "delivery sets" (also called "feeding bags" or "pump sets"). You have to replace them every so often; see recommendation further below. (3) Ebay requires the seller of medical devices to say something like "you must be a licensed medical professional to buy this product"; but don't worry, they never actually ask. Now for the settings. Think of this pump as putting sugar into coffee, using a spoon. The size of the spoon is the "dose"; the time between spoons is the "interval"; and how fast you pour the spoon in is the "rate". We only care about adjusting the size of the spoon (dose), and how much time between spoons (interval). We do not care how fast we pour the spoon in, so it might at well be as fast as possible so the fish don't hang out at the pipe and eat it all. 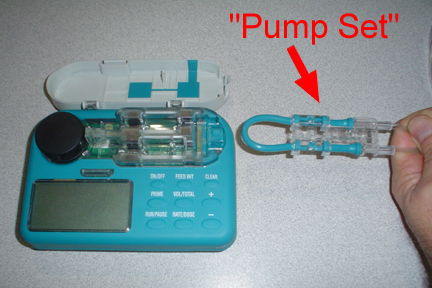 To make any pump adjustments, push the "run/pause" button first (which pauses it), and then make your changes. 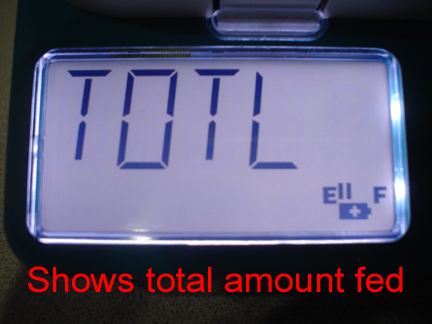 You can reset the "total amount fed" to zero by pushing the "clear" button when it is displaying. You can turn the unit off while it's running or paused; when you turn it back on, it will be in the same state (run or paused) that is was in when turned off. And it remembers all settings, including total amount fed, even it you unplug the AC adapter. Bag positioning if noise is a concern: The chiller has a thermostat, but the annoying thing about it is that it clicks every 30 seconds or so as it adjusts temperature. If it's in your basement, then it's no problem. But if it sits on the tank like mine does, or if it's in your bedroom, then you don't want this clicking. The way to eliminate it is to put the temperature selector on the coldest setting. This causes the thermostat to always stay "cooling". This fixes the clicking. However the temperature can get very cold after a day or so, and if you seal the top of the chiller with a towel, then the food will eventually freeze. To prevent this, leave the top of the chiller loosely open, and don't push the bag in down to the bottom. 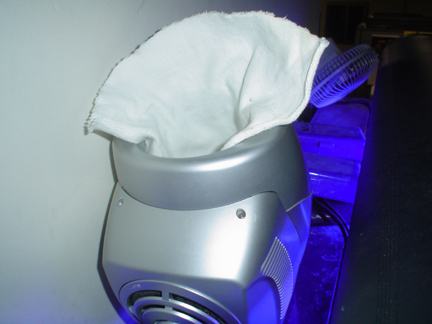 Use a towel, loosely wrapped around the bag, to keep the bag from touching the metal walls or bottom of the chiller. This works; it won't freeze. But if you wrap it too much, then the food will not stay cold enough. So this is certainly one area where experimenting will help. Of course if you don't mind the clicking, the thermostat will keep the food perfectly at just above freezing for you. Frozen spots: If you are using the "quiet" option where the chiller stays running constantly (no thermostat clicking), keep a close eye on the parts of the bag that touch the metal walls. If it's going to freeze, it will probably take 24 hours, or maybe even 48. 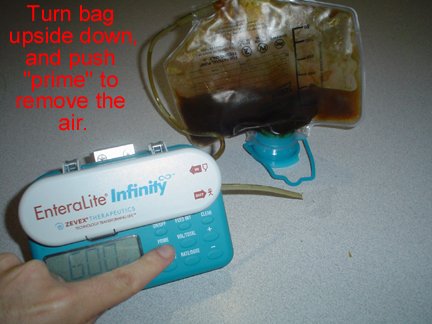 So check it the next few days by pulling the bag out and squeezing/mixing it all around, especially the bottom where it connect to the tubing. If any part is frozen, then use paper or a towel to keep the bag away from the wall. Also, you could pull the bag up a little, so it gets more air. A good idea is to wrap the bag around the tubing, before you slide the bag in. You might also put a thermometer in with the bag, which sticks out the top, so you can see it while it's running. 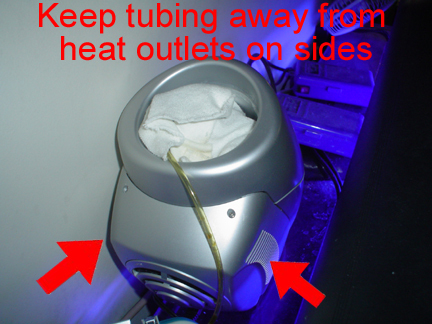 Tube near heat: Watch where the tubing goes when it leaves the chiller and heads to the pump. 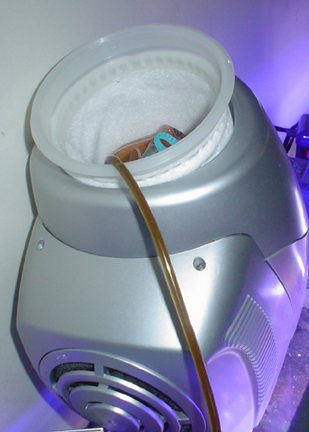 Hot air exits the chiller on both sides, so you want to route the tubing along the back part. Avoid strong lights too. Charger for pump: You don't need the AC charger to operate the pump, but you do need to plug it in once a month or so, for six hours, to charge it back up. So make sure you can get the charger cable to the pump, without having to move the pump. Of course, you could also just run the pump with the adapter connected, but that's one more cable going to the top of the tank. Power failures: If the power goes off, nothing happens to the pump; it keeps working on its batteries. The chiller however will stop. But the important point is that this model chiller, when the power comes back on, will switch to full-cooling (no thermostat). This is fine if you were previously running full-cooling, but if you had a temperature set (because you did not mind the clicking), the food will freeze when the power comes back on. For this reason I really recommend the full-cooling setting to be used all the time. Tube in display water: You want the tube to go into the tank water, so that it does not dry out. If kept above the water, food slowly starts drying out at the tip, slowly clogging it, and causing it to start spraying sideways. First attempts: I recommend trying it first in your sink, using just water in the bag. Do everything including putting it into the chiller, and letting it run for a few hours. If ok, then fill with food and start it. This first time, and anytime you make changes to the bag, try not to do it right before you go to bed, because if you folded the bag too tight, or if it freezes, the "No Flow In" alarm will sound and wake you up. Better to do it in the morning. Settings: When first trying to set the settings, it may sometimes not want to accept the numbers you try to set. This is because you have selected a dosing combination that is not possible. 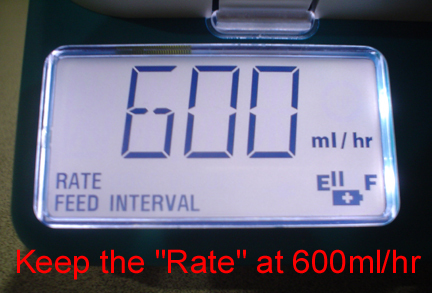 For example, if you accidentally set the rate to 0.1 ml per hr (instead of 600), and set the dose to 0.2 ml, and then set the interval to 1 hour, it won't accept it because if you dose 0.2 ml every hour, that is more food than the 0.1 that you set the rate for. Keep the rate at 600 and you should not get stuck as much. 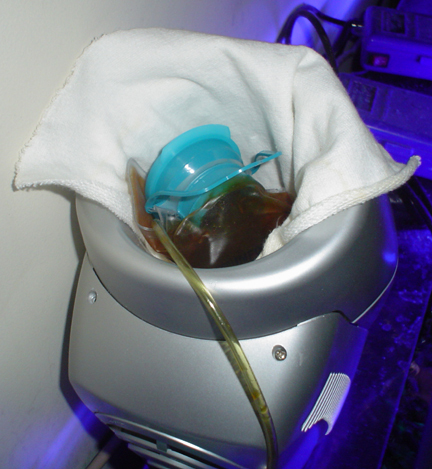 Tubing replacement: The tubing "sets", according to the operating manual, are designed for 24 hours of use at 125 ml/hr. This is a total of 3 liters that the tubing would flow, before it starts to "wear out". Since I'm only pumping 0.4 ml/hr (.0004 L/hr), it would take 7500 hours, or 312 days, before the "wearing out" started to occur. And I'm sure the manufacturer is being conservative since someone's life is on the line. So 6 months (180 days) would seem to be a good replacement time at 0.4 ml/hr. If you were pumping 0.8 ml/hr, you would replace every 90 days, etc. 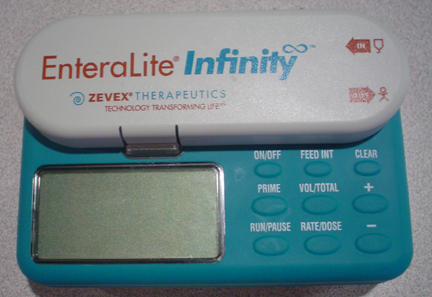 Proper pump model: Make SURE you get the Zevex EnteraLite Infinity blue pump. 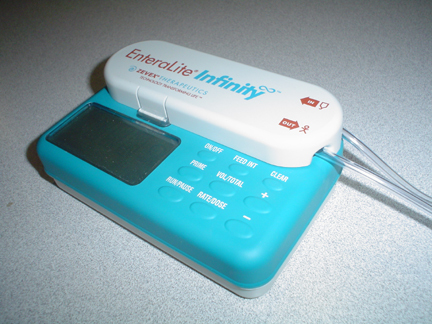 There are other EnteraLite pumps which are not Infinity, and they WON'T work. And there is another Infinity which is orange and not blue; it WON'T work. Separate units: Reeds Foods recommends not mixing food unless just before feeding. This would be accomplished with the (expensive) addition of a chiller/pump unit for each type of food you feed (I use three). Temperature alarm: Would tell you if the bag gets too warm, or if it starts to freeze. I imagine a freezer alarm would work. Shorter tubing: The length of tubing from the chiller to the pump could be reduced by 6" or so, if you cut it and spliced it with a connector. You'd need to test it though, to make sure the food you are using can get through the connector. Mysis might be a problem. Mixing: Although the crinkled and rolled bag will keep much of the food from sinking to the bottom, somebody should find a small, cheap paddle or servo that will shake or vibrate the bag every so often. Fan quietening: The chiller uses a computer fan that runs all the time. On larger tanks the sound is not noticeable, but on smaller or quieter tanks, or tanks in your bedroom, the fan could be made slower/quieter by inserting a resister into the power lead of the fan. The chiller is powerful and freezes as is; less chilling won't hurt anything. You'll have to experiment with the resistor size. Food types: With some experimentation, you could mix some solid foods (crushed flakes, tiny pellets, etc) into liquid foods, and maybe even add some type of thickener to it, to keep the solids suspended. Krill is too big for the tubing, but large mysis or small ghost shrimp should fit. Always test it first. Well as a test, in order to stimulate a dark purple gorg that was not opening, I increased the daily dose to 21.6 ml, and reduced the interval to 20 minutes (0.3 ml per 20 minutes). It worked; the gorg started opening all night, and about half the daytime. The dendronephtha was already always inflated, so no change there. However I don't know if it was the increase in food, or the decrease in interval, that caused the change. Figuring the increase in food would overload the scrubber, I added a small bag of Rowaphos. All is well so far; N is clear, and P is just a very slight blue that almost looks clear. But I'm going to remove the Rowaphos soon and see what happens. I'll also be looking for my next round of NPS to add, after I make some tank videos. Well I've pulled the Rowaphos out, and will monitor to see if N or P climbs (both are basically "clear"). The P was really low while the Rowa was in there... P was coming out of the rocks, frag plugs, and even the coralline (evidenced by algae growing on those spots, but not on the spots right next to them). The test-gorg I got about three weeks ago (very dark purple body and polyps; unknown sp.) has grown back a 1/2" (12mm) section of bare skeleton. The gorg originally stayed open 24/7, but now stays open only at night. The white dendronephtha still stays inflated about 90 percent of the time, day or night. It has re-oriented itself to point downwards, instead of the sidways/upwards that I glued it at. Goniporas all open and feeding 24/7. Tubastreas now open mostly at night. No target feeding; all feeding for the last 5 weeks has been from the continous feeder. 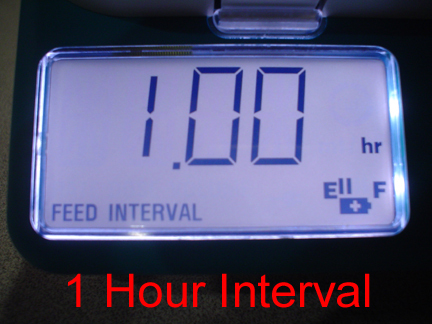 NPS feeding volume is now 0.3ml per 20 minutes (21.6 ml/day). A large part of the feed is Arctipods, which probably doesn't contain much for the NPS, however. Well I guess a system needs a period of time to be able to fully use the amount of food given to it. Origianlly I was getting some N after feeding smaller amounts of food from the Feeder, but then after removing the GFO, and increasing the feeding to 28 ml/day, N and P remained zero from there. I've now upped the Feeder to 43 ml/day (on my 100g). I wish I could have started out at this level. From an NPS point of view, the good news is that the tubastreas and goniporas are all taken care of automatically (no target feeding). Goniporas are open/inflated 24 hours, and the tubastreas are open all night and partially during the day. The scleronephthya stays a little open, although it was fully open in the sump. Mabye I'll move it back down to the sump. The white dendronephtha seems thinner, although it is 90 percent open. The purple gorg has stopped opening/growing. It has not receded or grown algae yet though. The 1 cm damaged area regrew for a few weeks (when the polyps were still coming out); it got to within 1 mm of being fully repaired, but stopped. I wish I would have had the current feeding amount when I put the white and the purple ones in. The feeding level then was 1/4 of what is is now. I'm still mixing one part phyto, one part roti, and 4 parts pods. Soon I'll probably increase the phyto and roti parts, since that's what's important for the white and purple guys. But I still need to increase slowly, since the goal is to do it with zero N and P.
Sounds like it's doing welll! Well 43 ml per day was too much for the scrubber to handle by itself. I was cleaning over a pound of algae from the scrubber each week, but it was just not enough (this scrubber was just sized normally, and with only one screen.) My ultra low phosphate situation ended quickly, and I started getting a light pastel blue in the Salifert phosphate test (nitrate stayed clear, however.) So now it's back down to 28 ml per day, and dosing is now every 10 minutes. I also put some gfo back in to speed up the recovery. I must say that the increased food did seem to speed up the growth of the digitaga, stylaphora, birdsnest and superman. The tubastreas and goniporas are happy as always. The white dendronephtha is not so well; I either started the increased food too late after putting the coral in, or I have the wrong food, or it was just not enough food. Could be flow too, off course. But it's starting to hang and not inflate. No change in the scleronephthya... still partially open. I'm going to move it to a lower flow area. The dark purple gorg did not make it. It was not receding or growing algae, but it completely stopped opening, so it was just a matter of time. For nephthas and nps gorgs, I'm going to try just getting many small ones of the same type, and putting them in different places. That should help identify flow problems, since food is constant throught the tank. One big nice thing is not having to feed the fish anymore. Every 10 minutes they are chasing the food that is coming out of the tube. I love this idea! I've been looking for this type of system. The major problem is the cost of the autofeeder. The cheepest I found it is $1,1000. Now I know this type of devise isn't going to be cheep, but that's past my current budget. Do you have any ideas of less expesive substitute? Side note, if you don't mind. You seem to know what food it takes to keep goniaporas alive (Phyto & Roti). Is this experience or a new studdy? I've lost 2 of them over the last year. Nothing I read online seems to know how to keep them alive. If your present ones are thriving (thread-listed feeding unfortunateness aside), would you mind sharing your secret? I want to have one but I feel terrible risking its life without some more facts. I'm just experimenting; no recommend results yet.